She threads some flowers into the wrapping sheet – also made from bamboo and kindly supplied by fellow delegate Gordon Tulley of Respect – and calls for six volunteer pallbearers. Dawn is only small, and they manage her with ease – but what about the bigger-boned, asks Martin, a trainee eulogist? In the strip-lit annex behind him, the cheery bustle of delegates and interested outsiders bears him witness. This is the third annual funeral industry conference that he and co-founder Brian Jenner have run (less successful titles have included The Joy of Death) and the busiest yet. The local papers and trade press are all here, snapping away at the bicycle-riding-skeleton contraption that Cowling has laid on for them. There’s a gala dinner for 120 tonight, with special awards for Best Embalmer and Best Gravedigger. And instead of silverware, ­winners will receive statuettes of the Egyptian funerary god Anubis. It’s the kind of levity never ­encountered at the bi-annual shindig for the National Association of Funeral Directors (NAFD). “The men in black,” Cowling calls the opposition, unlike his mainly female, floaty-dressed friends. Dominated by the Co-op, Dignity plc, Funeral Partners and the hedge fund-owned LM Funerals – whose combined UK business is worth an estimated £5bn a year – the association controls about nine tenths of the market. (Few seemingly independent operators are genuinely so.) But Cowling and Jenner are promoting the other 10%’s “alternatives to the coffin glinting in the February sunlight”. So the earth-bound can choose from felt “cocoons” to willow and banana caskets, displayed today on a revolving stand. Going up in smoke? Then Tosh Abbott and Cath Pratley might be able to interest you in their latest wicker product. It’s a little Viking ship with a basket for carrying ashes, and the idea is that you float it out on a pond and shoot burning arrows at it. Launching it this morning, they had their first sale within an hour. But maybe you’re more of a grease monkey? Then have your photo taken on a child-size version of a Motorcycle Funerals’ bike-and-side-hearse combo – they’ve got seven of them, operating round the country. Feeling peckish? Dig into one of Commemoration Cakes’ top-sellers: St Paul’s Letter to the Corinthians, scanned from a missal and computer-printed onto the icing, with a hand-iced ribbon between the pages. Faith, hope and, mmm, fruitcake. Or perhaps to James Norris of DeadSocial.co.uk, who wants people to tweet messages from beyond the grave. There are other dotcoms, too: aboutthefuneral, for example, which aims to be a one-stop-shop for trade and public; or funeralgiving, “designed for funeral organisations interested in offering clients a tribute website service with a fully integrated in-memoriam giving facility”. And there’s a smattering of quite slick outfits, such as Leedam, which markets meadow-burials in greenbelt vales and chases; or funeralmap.co.uk, which offers, among its services, training up to Level 3 for an Ofqual-recognised Diploma in Funeral Celebrancy. 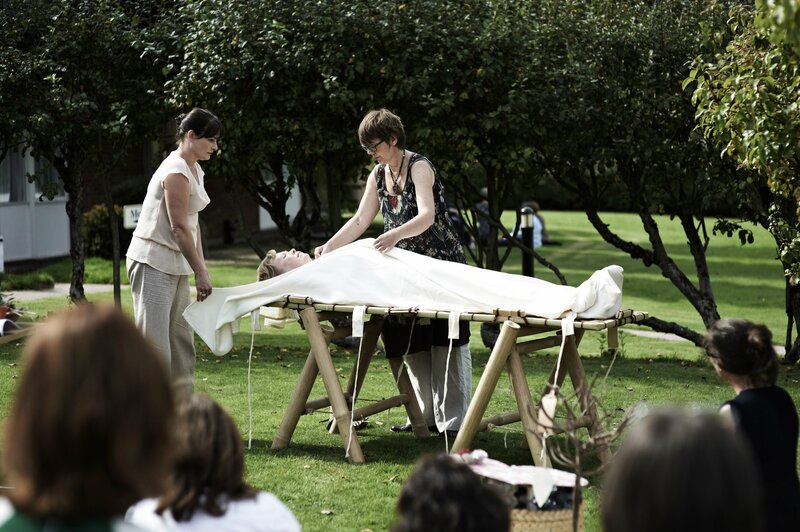 But pride of place goes to the now-established pioneers, the Natural Death Centre – a sort of eco-death information exchange – and its offshoot – the Association of Natural Burial Grounds. And strength in numbers goes to the multitude of facilitators, celebrants and counsellors here, several from the OneSpirit Interfaith Foundation. Products of organised religion’s decline and the continuing need for ceremony and spirituality, they gather at intervals in the yurts for the Grave Talk and Death Café sessions, when they mull over state social fund payments and the protocols for giving a body to science. That’s a problem on which a punter from Scotland wants advice – that and cremation. You see, the trouble is, he’s Jewish, and his family won’t approve of either . . . He’s a promising lead for Ru and Claire Callender, then. The Green Funeral couple specialises in a stripped-down service, influenced by “punk . . . crop circles, rave culture and psychotherapy”. Taking as their title “Grief: It’s Not About the Car”, they’re among the speakers booked for the Acorn Room. In this stunningly anonymous space, the talks are for different target audiences. There are technical seminars on public speaking and search-­engine optimisation. There are more whimsical lectures on near-death experience and famous mis-burials. And much anticipated is academic Lucy Talbot’s celebration of “Maudism” (a pursuit she has named after the funeral-crasher in the 1971 film Harold and Maud). Still, the bar is best for shop-talk. Here the themes are regulation, feminism, transparency, cost . . . and the general dastardliness of the NFAD. Bankrolled by the big players, the association in turn funds the All-Party Parliamentary Funerals and Bereavement Group; and some would say this consultative body, which lacks any consumer representation, stands to profit most from the status quo. It’s not just that the association opposes external oversight and prefers self-regulation (so, as one of the speakers points out, “you could let a cannibal out of prison and he could set up as an undertaker the same day”). It’s the wagon-­circling mentality of the old guard that really annoys the Bournville contingent. Poppy, 31, is a bit of a cover girl for the progressives. A one-time Samaritan, by 26 she was an expert in 20th century art at Sotheby’s. By 28, she’d “had enough of those people” and “wanted to do something to help people like me”. Following her father’s death – and during a long recuperation from typhoid, caught while travelling – she decided that the funeral industry was as ripe for a shake-up as the airlines were before easyJet. Now she can promise to get the departed into the ground for about half the average price. She uses a van painted with poppies instead of a hearse, puts her workers in dark green fleeces rather than mourning rig, and books Addison Lee people-carriers, instead of twice-as-many limousines, each costing £250 for half a day. Her philosophy – which won her the Lloyds Bank’s First Women Award last year – is to cut her own costs as much as her clients’. And that’s the over-riding message of the Ideal Death Show. We need to look beyond the ­Victorian fetishisation of mortality, beyond the 20th century’s hands-off approach – and perhaps back to a time when we were more comfortable with the Reaper, even familiar. Listen in, and you’ll hear there’s a movement for midwives to be trained in preparing corpses, as in olden days and tribal communities; there’s pressure for a consumer-rights body; and above all, there’s great warmth and good humour among these modern dealers in death. 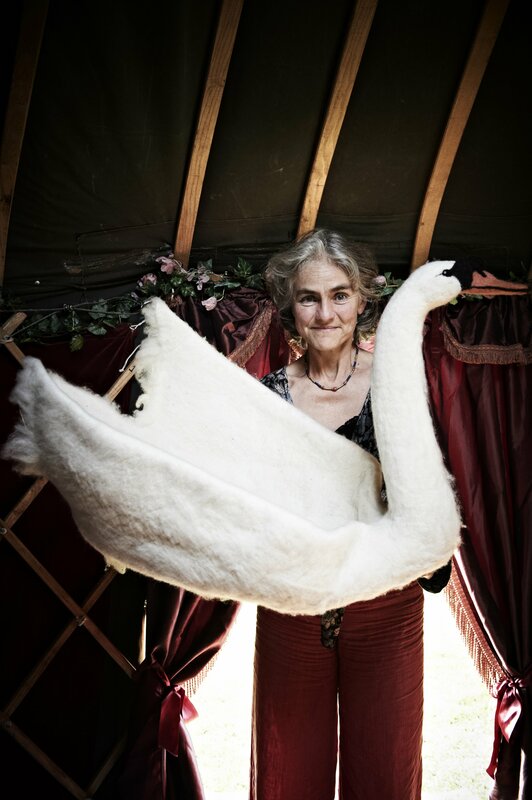 Don’t judge them by Cowling’s stunts – funny though they are – but rather by their quite heartwarming wake-cake bake-off won by Natalie Buckingham, of Buckinghams Cake Palace, with a heart-shaped entry folded in real-feather angel’s wings and dedicated to the memory of her still-born child. More cadavers deserve to be delivered into these heroic, warm hands. Enough shrouding in mystery. In the British funeral industry – and apologies for this ancient trade gag – we need more people thinking out of the box.